1. 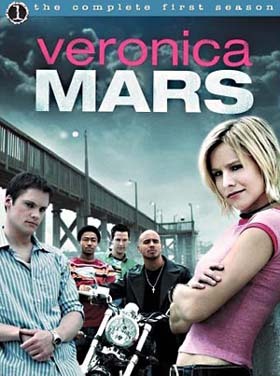 A week or so ago I decided that I was going to start watching Veronica Mars. Now I watch it as often as possible and after only a short week, am in the middle of season 2. Many people told me how much they loved it over the past few years and now I'm kicking myself for not hopping on the bandwagon sooner. Then again I may pull a Felicity or Gillmore Girls if it doesn't end the way I want it to and end it when everyone is happy and people are in the relationships I want them to be in. Right now, I'm loving everything about Veronica Mars. Judge me if you must. 2. I signed up for the DC half marathon and so I've been running a bit. Well, twice so far. But it is a start, right? 3. It has gotten real cold here the past few days - I'm talking single digit temperatures. Wowza. 4. I am really starting to feel like things are normal here - I know most of the people at parties now, I am making more friends and am being included in things, etc. 5. I went to the opera last week - La Traviata. I wish I could tell you to go see it, but if you are in New York, skip this one. I loved La Boheme, though. 6. Tonight for FHE we played "Minute to Win It" which was highly entertaining. 7. I made a bet with someone last night that I would kiss someone by Valentines Day. This is all sounding very familiar - is it not? Wednesday. Is it only Wednesday? I wish I could write more than I do. I have to be careful about what I write because for the most part, I'm not really sure who reads this. With my luck, the very person that I'd be writing about would be reading this which could be detrimental in many ways. It has been a long week and I wish I had more dialogue to share with you of what really goes on in my life. To be vague and brief, I will just say that this week has had its challenges and I am quite tired. Last week I had a scheduling conflict between my work post-holiday party and working at the temple for the first time here in New York. I called the temple and told them about my conflict - it is a bit hard to avoid the holiday party when there are only 5 of you in the office - and they were fine with me coming late. The problem is that I ended up at a gay bar with my coworkers and never went to the temple. I did mention to the temple that there was a possibility that I wouldn't be able to go at all; I think. Last Saturday I went to Coney Island in the freezing cold to get some pizza and I enjoyed the long subway ride and my tour of Brooklyn that went with it. I am looking forward to going back to Coney Island in warmer weather. The pizza was good and the company was better. I karaoked my heart out that night with some friends and taught them all the San Francisco way to karaoke, which means that everyone sings along and there is a lot of dancing. Possibly on the table, but that is up for debate. Sunday I had big plans to come right home after church and work on some family history, take a nap, and watch the CES fireside from the warmth of my bed. I ended up at a missionary discussion that went on for 2 hours, a potluck dinner, and at the church building for the devotional. My plans were good, but that was better. Feeling loved by those around you is always better. As I talked to my friend last night about New York and the things I am experiencing here, she said "I think that X is the reason that you moved to New York." I think that her hypothesis is valid. I also think that it has been amazing to me to see how the Lord can bless us using the same people over and over again in our lives. For example, when I think about my time in college (and EFY), I can think back and see how big of a blessing Traci was in my life. She might not remember, but she invited me up to her parent's house in Midway pretty regularly and it was just what I needed at the time. I had some great experiences with her then, and I am being blessed by having her in my life again, 10 years down the road here in New York. And she isn't the only example - there are lots of them. I also decided today that I don't mind the cold weather. Maybe I will change my mind next month, but maybe it is the non-sweatiness of it all that makes me giddy inside. Sorry about the lack of photos the last few days - I have had two twelve hour workdays and one fourteen hour workday this week, so if you'd like to see a photo of my desk or my computer screen, that can be arranged. For now, I am off to fold the laundry on my freezing cold bed. Today I decided that these are the best purchase so far of 2011. I realized yesterday while riding the shuttle to work that I know more current R&B music than I do current pop music due to the driver's taste of music. also, it is snowing again outside. Happy Friday. Red Pants Friday. Who needs a boyfriend who can touch you? Apparently I don't since I have the Elders. amy came to visit for new years. so glad she came.